reception, non-smoking hostel, free internet/WiFi, free breakfast. 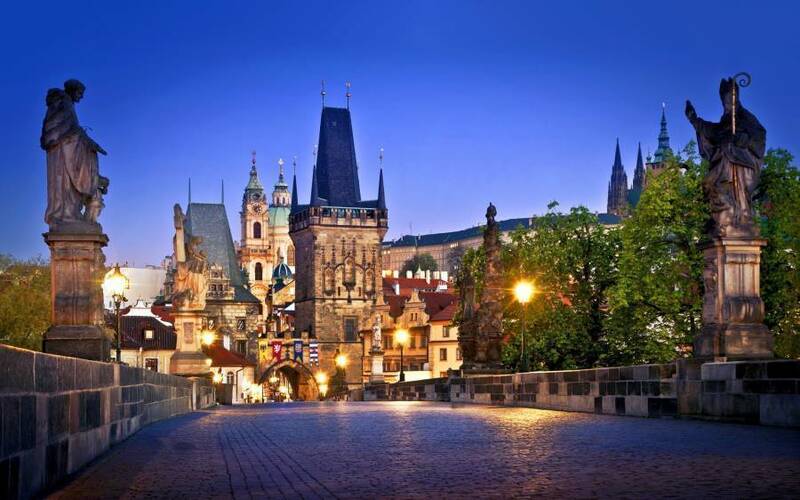 CharlesBridgeInternationalHostel is located in a area rich of history, we are located in the middle of Charles Bridge , John Lennon Wall and Prague Castle. There is a tram stop right by the metro station; there you catch tram no. (on the same side of the road, where is the exit from metro station) and get off at the first stop, Malostranské Námestí. Take the street on the left leading towards Charles Bridge (Mostecká street; you’ll pass by McDonald’s). Turn left onto Na Kampe then Turn right onto Hroznová you will pass by the worldwide famous John Lennon´s Wall then continue straight until you see Jhon lenon pub as the Hostel is located right next to it. Welcome! After the last escalator, take the left exit from the metro station then walk to the right. You will pass by Gloria Jean’s café; on the crossing with the traffic lights keep going straight. Follow the street (U Luzického semináre) for approx three minutes and then take the first street to the right (Mísenská). This street will lead you to the Tower of the Charles Bridge. Take bus no. 119 from the airport and get off at the final stop, Dejvická. There you catch metro line A (green line) going in the direction of Depo Hostivar and get off at the second stop, Malostranská. A ticket for 32CZK will cover your whole journey to the hostel. The tickets are available at newspaper/tobacco shops or the machines. Don’t forget to validate the ticket right after entering the bus/metro/tram. After leaving the metro, follow the directions from the Malostranská Metro station as above. Take metro line C (red line) in the direction of Haje and get off after one stop, at Muzeum. Change there to metro line A (green line) going in the direction of Dejvicka; go for three stops and get off at Malostranská. A ticket for 32CZK will cover your whole journey to the hostel. The tickets are available at newspaper/tobacco shops or the machines. Don’t forget to validate the ticket right after entering the bus/metro/tram. After leaving the metro, follow the directions from the Malostranská Metro station as above. Take metro line C (red line) in the direction of Haje and, after three stops, get off at Muzeum. Change there to metro line A (green line) going in the direction of Dekvicka; after three stops get off at for three stops (direction: Dejvicka) and get off at Malostranská. A ticket for 32CZK will cover your whole journey to the hostel. The tickets are available at newspaper/tobacco shops or the machines. Don’t forget to validate the ticket right after entering the bus/metro/tram. After leaving the metro, follow the directions from the Malostranská Metro station as above. We provide airport shuttle service for discounted prices for our guests.